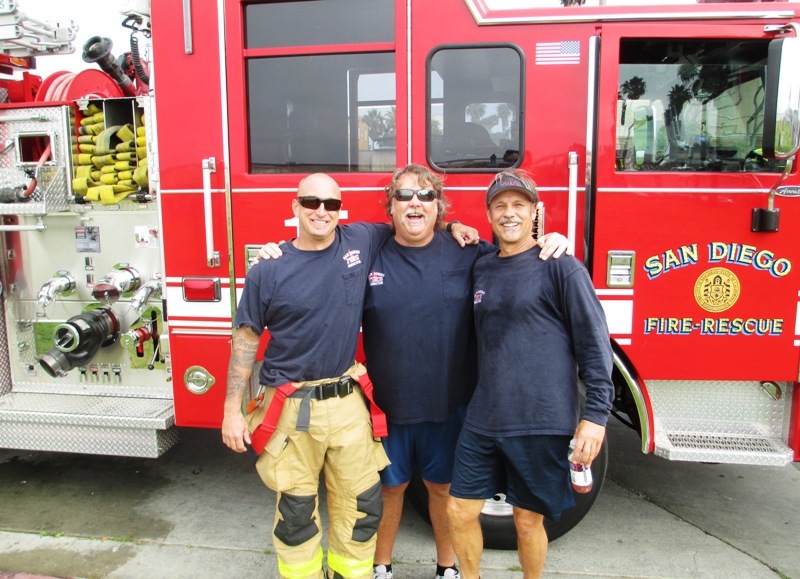 Editor: A few months ago, OB Rag reporter Matt Wood had the privilege of spending the day with OB firefighters – the crew of C Division at the Ocean Beach No. 15 Firehouse. 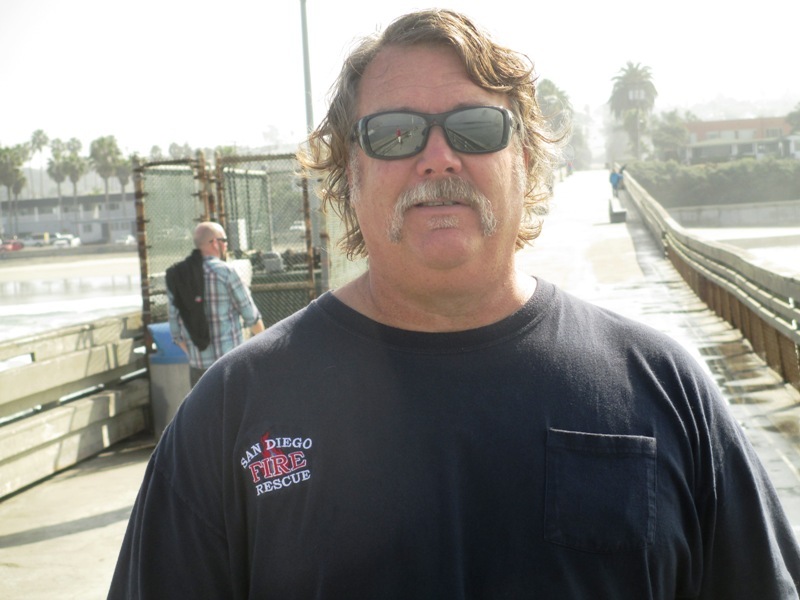 His post was part of the Rag’s continuing series of articles about the public servants who serve the people of Ocean Beach – our effort to put faces on good folks who often go unknown to the neighborhoods they serve. Matt’s story got great feedback and he was invited back again – this time to hang out with one of the other two divisions. Here’s his account of that day with them. 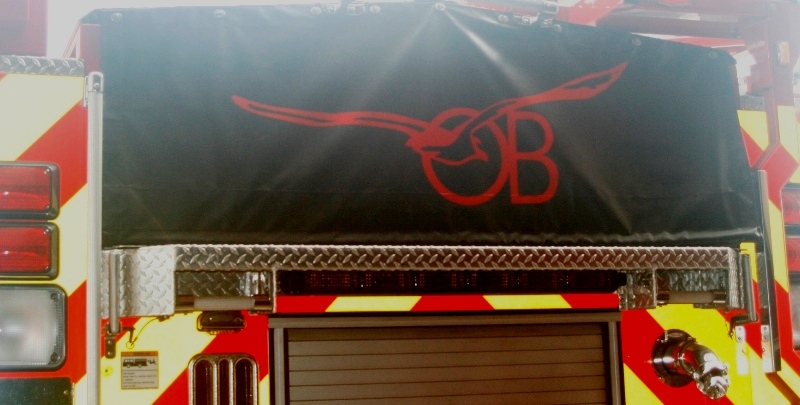 A custom-made hose cover showing pride in OB donated by a neighbor. The A Division is losing its leader. Instead of mourning the loss of a tremendous firefighter, they are taking the opportunity to celebrate. 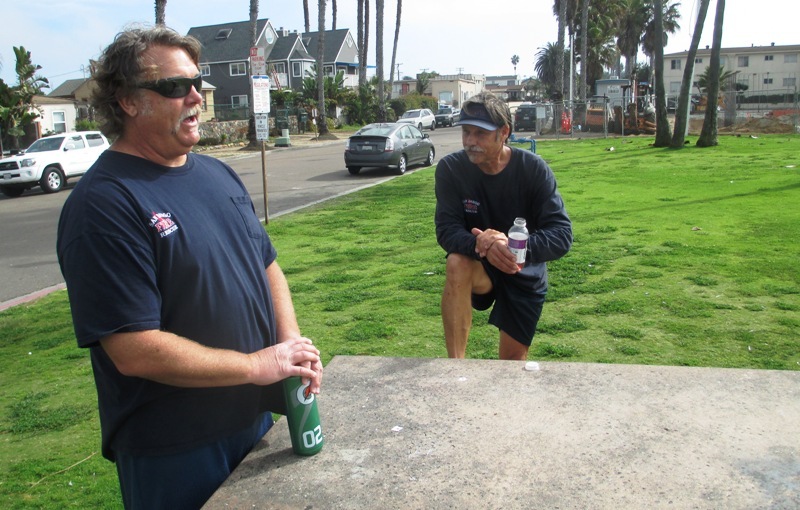 Division captain Bryon Wenger will retire later this month as he closes in on 38 years fighting fires, 27 of them in San Diego and the last few (he can’t completely remember how long) here in OB. To celebrate, Wenger is going for a run. Specifically, on his last day he’s going to run all the way from his home in Lakeside to the station on Voltaire. That’s 24 miles, nearly the length of a marathon. “Well, not quite a marathon,” Wenger says with a smile. You’d think that a guy who’s about to retire would want to take it easy on his last day. But that’s definitely not Wenger’s style. He turns 57 the day after his retirement, but could be mistaken for someone 15 years younger. His health is something Wenger does not take for granted. Wenger should know. He’s seemingly worked in every house in town, starting in Forest Service, followed by stops in Camp Pendleton, South Bay, Kearney Mesa, Mission Valley, Sports Arena and Pacific Beach. He helped open the No. 45 station – a little shack of a place in the shadows of Qualcomm Stadium where they had basically a trailer and nothing else. 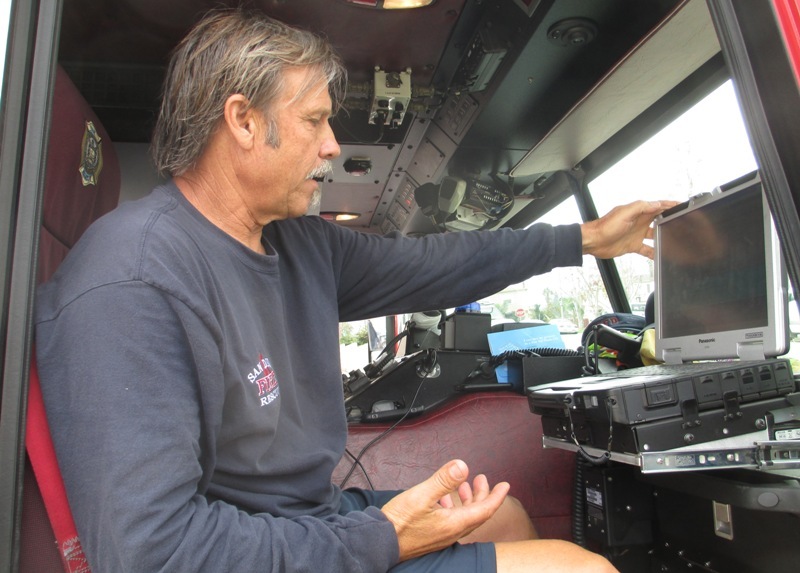 Captain Bryon Wenger shows how the fire department’s computer system works in the truck. He is not alone. Matt Smith, the newest member of Division A, has lived in the area for much of his life, but only been stationed in OB for a few weeks. Most times it’s hard to wipe the smile off his face as he works his dream job. Mike Morley, a medic on the station’s C Division, has been in the station for nine years and has fit in quite nicely with the group. Mike Morley on the OB Pier after his morning workout. They’re all planning to take Wenger out for a good ol’ OB pub crawl the day after he retires – which just happens to be his and Morley’s birthday. But enough about the celebrations and retirements and a love of OB. Let’s get into the nuts and bolts of what these guys do. First, here’s how the divisions work: There are three divisions in the station made up of four people each. They are made up of a captain, engineer, medic and firefighter. Each division works a 24-hour shift every other day for a certain amount of time before getting more extended time off. “It’s definitely a family. It’s fun,” said Morley. His best friend of 30 years, Todd Barry, is on the C Division with him. Mike Morley unloads gear at a house during a call. 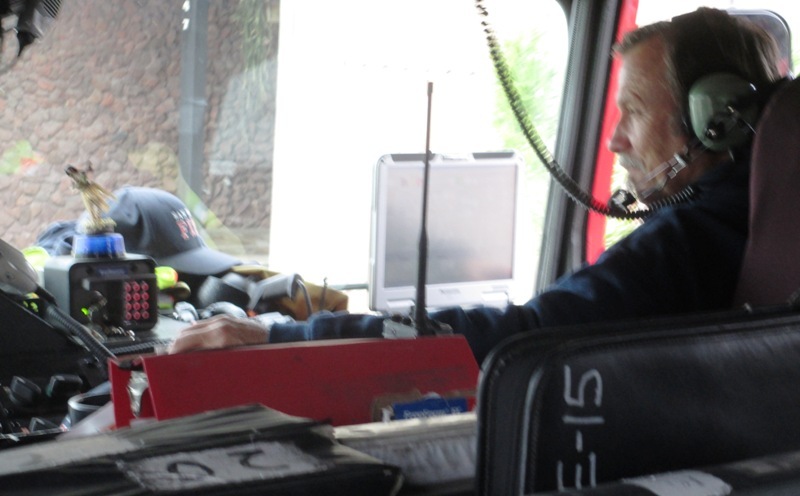 The crew tries to keep a regimented schedule, something that is ultimately out of their hands and dictated by who might need their services in the blink of an eye. Wenger puts an emphasis on learning to the division he oversees, assigning tasks for the crew to help them become better at their jobs – when they have the time. He has them work on certain lesser-known aspects of the job such as manipulative techniques related to breathing. Some days they’ll practice tying knots or throwing ladders. He has taken advantage of a grant from Homeland Security to train himself and other crew members in a firefighter survival program. It shows firefighters the intricacies of techniques that most people wouldn’t think of, like how to use a hose to either get into or out of sticky situations. One part of the program showed him how to slide down a ladder headfirst. Gear piles up in the fire truck as the crew goes on a run. Their days are filled with preparations: Getting the equipment ready for anything. Scoping out the fastest routes around the neighborhood. Testing hydrants. Checking out buildings for the best routes in and out. “Sure is nice to do it during the day instead of when it’s full of smoke,” Wenger said. The crew all has a workout regimen, although maybe not quite as strenuous as Wenger’s. Most of them run on the beach. Morley, who played college football at Texas A&M, prefers the elliptical machines in the station. One way or another, they get a workout in. Much of the rest of the day is filled with cooking meals, taking care of the station and waiting for the inevitable call they know is coming sooner or later. Ask any of the firefighters what their favorite call is and the answer is certain to be unanimous: structure fire. 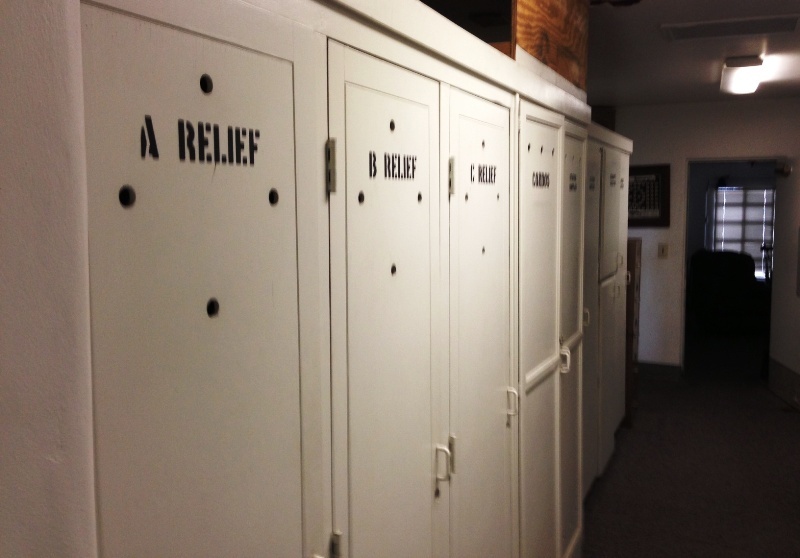 Storage lockers inside Station 15. The OB crews definitely have experience. 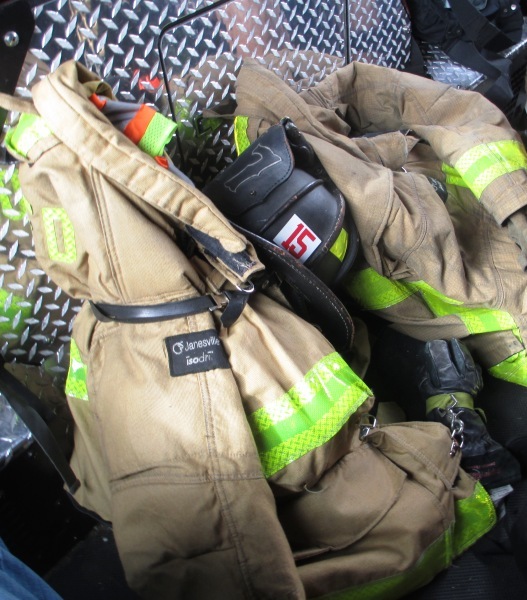 With the fire department’s seniority policy – “Once you’re on, you’re on, unless you leave,” Morley explains – it is definitely a sought-after spot, especially for veteran fighters who have put in their time. Most of these guys have cut their teeth for at least a year or two at inner-city stations. Brown spent nearly 10 years at two different stations near City Heights. “We don’t have the number of fires as the inner city,” Wenger said, although sometimes these guys may think that’s not such a good thing. 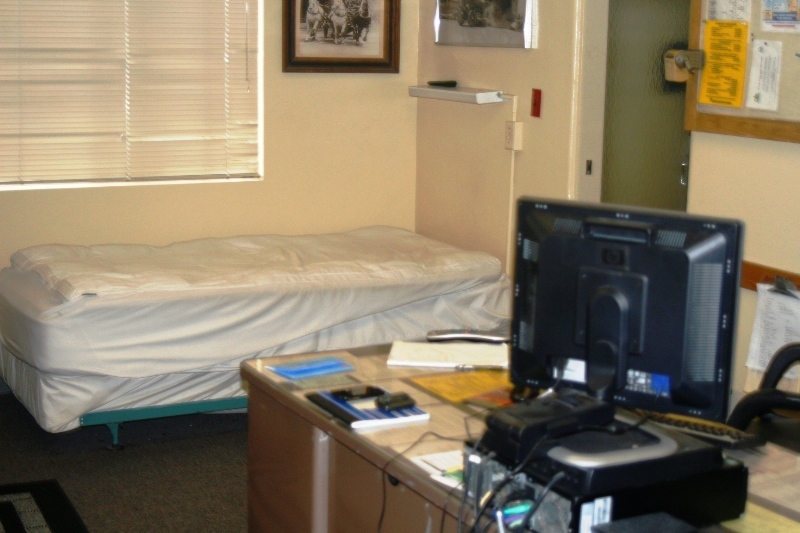 Typical room inside the firehouse. While they don’t get the same volume here, there are still plenty of calls. They estimate around 80 percent of them are medic-related. And Morley says too many of them are familiar faces. He said it really gets to him to see so many people take advantage of their generosity while getting in the way of them helping those who really need it. He stresses that he wants to help everyone he can, but gets bogged down by many repeat callers – most of them living on the street or in their vehicles. The last time I hung out with these guys, there were no calls. Needless to say, it was a bit disappointing. Just like them, I want some action. Sure, they let me ride in the truck. We took it down to the beach, where they did their morning workouts while I bugged them all individually about everything I could think of. We did much of the same routine this time. Pull the truck out of the station on Voltaire. Everyone buckles up and grabs a headset. We hit the beach and I chatted with each guy while the others did their workouts. Wenger did his normal four-to-six-mile run. Did I mention the guy is about to turn 57 and is about to retire? A run like that doesn’t even slow him down. On the way back, one of them says to me, “Hey, you wanna do lunch with us?” Of course I do. 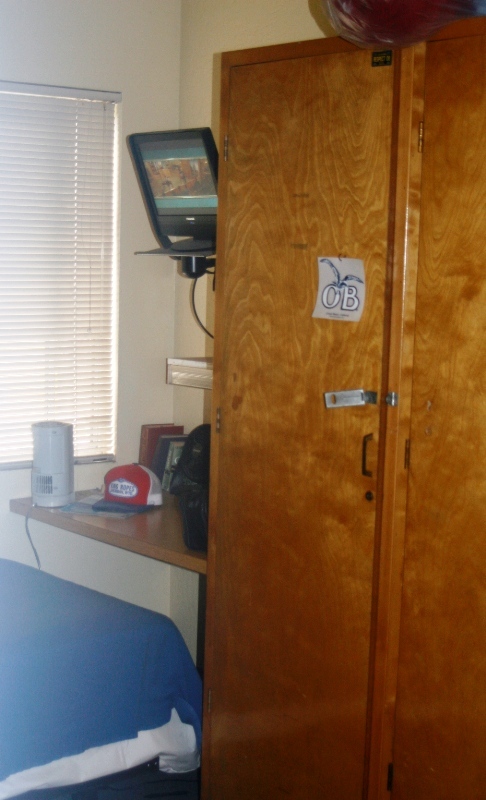 Bedroom and office all in one. So we hit up the Stump’s to grab food to make lunch and dinner. If you think these guys demand freebies or special attention from stores and restaurants, you’re dead wrong. Christopher Brown, the crew’s medic, gives it a bit more perspective. 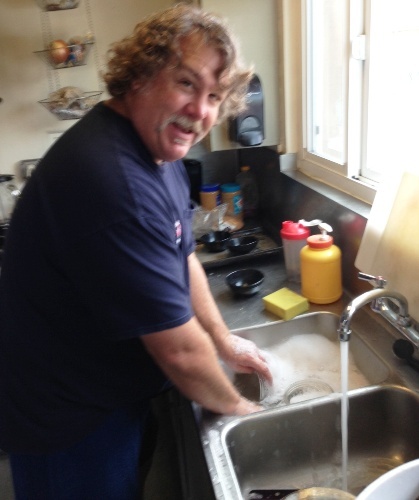 Mike Morley does the dishes after making lunch for the crew. So they gather up their collective money and go into the Stump’s to buy groceries. The only difference is, when you’re driving around in a fire truck, parking can get a bit trickier. As the other guys do the shopping, I stay out with Wenger. We talk about his impending retirement, and the job as a whole. 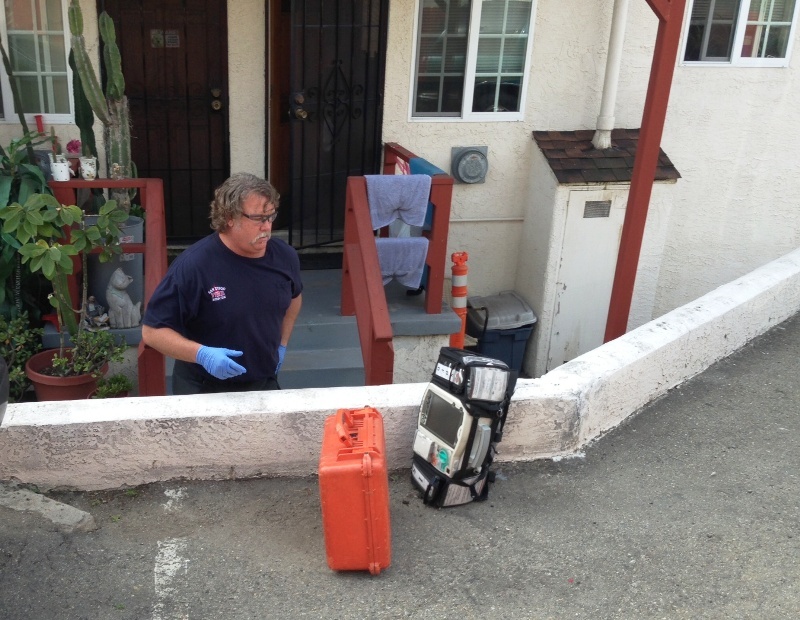 He tells me that, amazingly, the San Diego Fire Department has never had a fatality on the job in 100-plus years. I find this unbelievable, but have no reason to doubt him. Wenger gets a bit wistful when talking about retirement. He says his plan is to spend the summers with his wife at their place in Idaho. It’s nearly noon and still no calls on the day. I ask him if that’s normal. Do you ever go a whole day without a call? Christopher Brown drives and Bryon Wenger navigates during a call. As if on cue, the chatter starts up on the radio. A woman in her 60s is having trouble breathing near Chatsworth and Voltaire, just a couple blocks from us. Something in the truck starts beeping, and Wenger gets on the computer. “We got one,” he says. Within a few seconds, the rest of the crew – having ditched the grocery cart in the store – is in the truck and preparing to move. 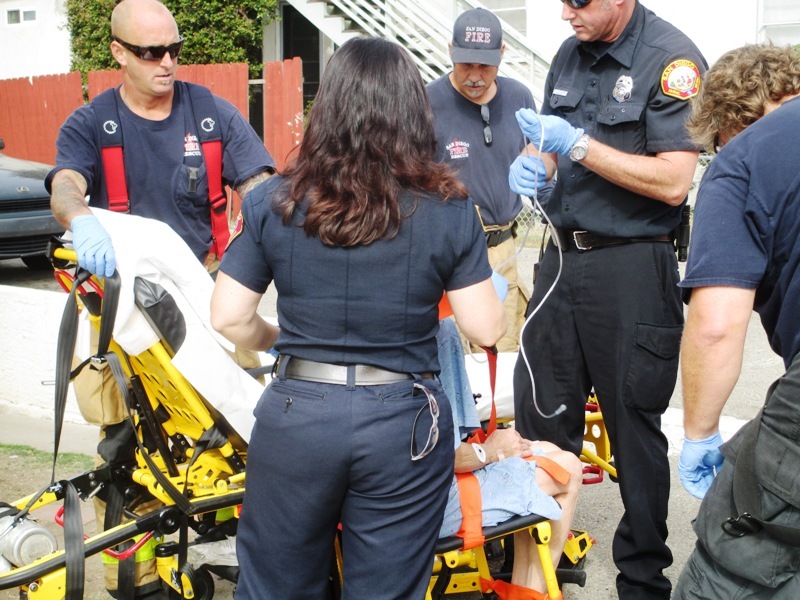 The crew works with EMTs to help a patient into an ambulance. The short drive is pretty quiet as everyone prepares for what they might need to do. It sounds like just a routine medical call – they estimate about 80 percent of their calls are like this – but you never know. We get to what we think is the house. A couple in a car is coming out of the driveway. “Is this (the address)?” Wenger asks. They nod. In the blink of an eye, the guys have their gear up the stairs and are in the apartment. A man who looks like he could be her son is on the phone. He signals us to the bedroom, where the patient is in bed. Immediately, Morley takes charge, asking a series of questions. “Are you having trouble breathing?” Yes. “Have you been coughing a lot?” Yes. “On a scale of 1 to 10, how hard is it to breathe?” A nine, she answers. A few seconds later, they have an oxygen mask on her to help the air flow. A few minutes later, a pair of EMTs arrive with a mobile wheelchair device. Wenger and Morley are both on the radio, talking to the hospital about the situation. They are calm and cool and a few minutes later, the woman is in the ambulance and on her way. The whole scene couldn’t have lasted more than 10 minutes. Brown is normally the crew’s medic. But today he is filling in as the engineer, the guy in charge of making sure the equipment is working and available to ensure the others can do what they need to do. In this case, it involves moving furniture to get the woman out and making sure a path to the ambulance is clear and safe. “Whew! An engineer’s job is tough, man,” he says with a bit of sarcasm, although I notice he’s worked up a bit of a sweat. Mike Morley and Bryon Wenger cool down after their morning workout. This was by no means a test of their skills. It was more or less an everyday occurrence. Yet there’s still a sense of relief as we head back to the station. They’ve all seen this before, and it usually ends OK. But there’s always the times it doesn’t. “We try to get people to the hospital and get ‘em better,” Smith says after we get back to the station. Then he gets a little more serious. I think about it, and after a minute, it does. Dealing with death and seeing the things these guys do, it would never get easy. But if you get hung up on that aspect of it, you’re not going to be able to do your best. Back at the station, it’s time for lunch. Morley is on duty, and the guys refer to him as “The Sandwich King.” They’re not joking. He cooks up a French dip-like sandwich in the oven with his own style of au jus sauce. We wolf down the meal, talking about the soccer game on the TV, Wenger’s upcoming retirement – and the pub crawl they’re planning for him after his last day. Typical workplace banter. Which it is. At least, until the next call. Matt – Awesome write-up. What kid didn’t want to ride around in a fire truck? Now Matt has made every adult kid envious. This was a great read. Love all the photos too. These guys really are a class act. The things they have to deal with are truly not for everyone. 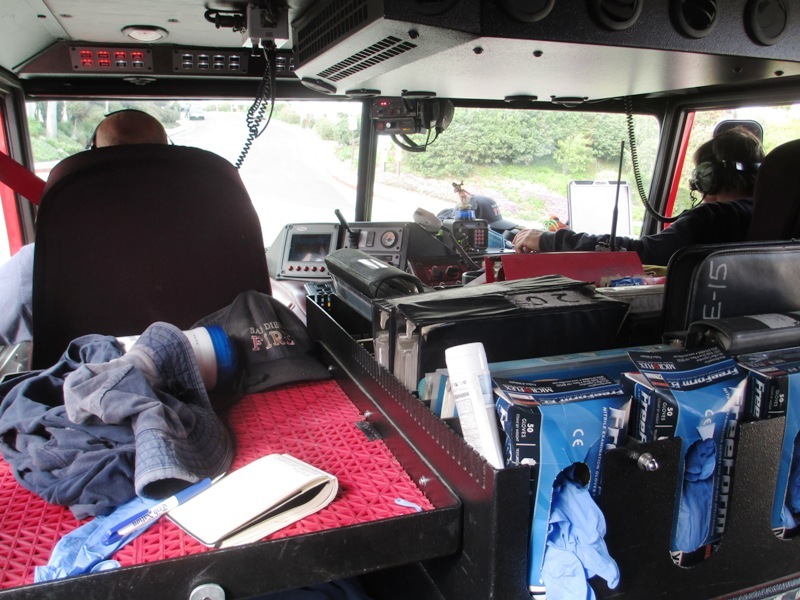 And yeah, I’m a little jealous Matt got to cruise around in the fire engine all day…. My son is an engineer with the federal fire dept here in SD. Utmost respect for what you guys do always. And I always love to wave to #15……. My brother is a fire fighter in San Diego. It can be a scary job so I appreciate you doing this story. Great read!